DONETSK, Ukraine -- The regional branch of the Ukrainian opposition faction UDAR (Ukrainian Democratic Alliance for Reforms) has come up with a creative way to poke fun at President Viktor Yanukovych with the launch of an open-air museum in the eastern city of Donetsk. The seat of power in Ukraine? UDAR says the purpose of the museum is to "show the public which promises Yanukovych failed to deliver and which ones he fulfilled." 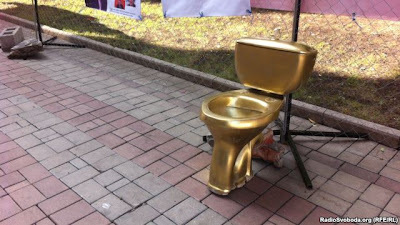 One of the main exhibits at the so-called Museum of Yanukovych's Promises is a golden toilet. In 2011, the French news agency AFP reported that the bathroom in Yanukovych's luxurious private residence in Mezhyhirya was decorated with semiprecious stones that cost 350,000 euros ($467,000). The president’s press office denied the report. Also among the exhibits is part of a coffin, which UDAR’s regional head, Egor Firsov, says is meant to illustrate the Donetsk area's declining population. "Yanukovych promised us a population of 50 million, but the population is dying out and the Donetsk area is leading in mortality," Firsov says.